In late l991 and early 1992, at the time of the first Intifada, Joe Sacco spent two months with the Palestinians in the West Bank and Gaza Strip, travelling and taking notes. Upon returning to the United States he started writing and drawing Palestine, which combines the techniques of eyewitness reportage with the medium of comic-book storytelling to explore this complex, emotionally weighty situation. He captures the heart of the Palestinian experience in image after unforgettable image, with great insight and remarkable humour. The nine-issue comics series won a l996 American Book Award. It is now published for the first time in one volume, befitting its status as one of the great classics of graphic non-fiction. 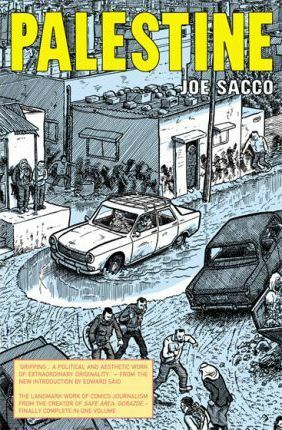 "A political and aesthetic work of extraordinary originality, quite unlike any other in the long, often turgid and hopelessly twisted debates that have occupied Palestinians, Israelis, and their respective supporters... With the exception of one or two novelists and poets, no one has ever rendered this terrible state of affairs better than Joe Sacco"
Joe Sacco, one of the world's foremost cartoonists, is widely hailed as the creator of war-reportage comics. He is the author of Palestine, Safe Area Gorazde, The Fixer, Notes from a Defeatist and Footnotes in Gaza, all published by Jonathan Cape.